Summer is in full swing, and with the beautiful weather we’ve been having, Summer BBQs and garden parties are commonplace. Everyone is enjoying the sunshine with their friends and family, alcohol is flowing, the kids are splashing in the pool. Most people would be worrying more about the clouds ruining their day or the heat is too close than the safety of their garden electronics. The truth remains, however, that electronics can pose a health risk no matter where they are or what the weather is like. Here we discuss the common garden electronics you will use in the garden this summer, and how to keep your summer garden party safe. Electricity is used to power a lot of gardening equipment in the summertime. Lawn mowers, outdoor lights, pool electrics and other garden maintenance equipment can be obvious uses of electronics to be careful of. While most people won’t be cracking out the lawn mower at their BBQ or summer garden party, there are plenty of other common garden electronics which may be in use that people don’t think about. An electric BBQ that hasn’t been maintained or checked since last summer could have developed a dangerous technical fault. Electric fountains or water features with electric pumps may not have had any maintenance work on them since their installation. Even bug lamps or electrically heated propagators can connect an electrical socket and pose a danger. 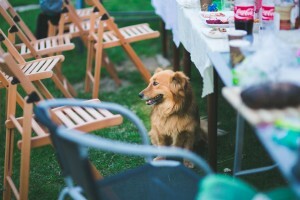 The bigger your summer garden party, the harder it is to keep track of all your guests. If you have young children attending, they may well go off to explore and play with electrical equipment, which if not maintained, could be fatal. Most electrical garden equipment such as hedge trimmers, mowers and propagators, will plug into a power socket. Any socket that connects to the mains should be used with a Residual Current Device which detects electrical faults and disconnects from the power supply before any damage can be done. Making sure your main switchboard is connected to the fuse box also ensures protection against electrical harm. If this isn’t possible, plug-in RCDs are available to buy and well worth the investment. Plug in RCDs have a test button so you can make sure there are no faults. Any plug-in garden devices that trip regularly or for no apparent reason should be disposed of and not used at your summer garden party. In hot weather, we are more likely to use water, either for watering plants or for cooling down. Electric watering systems in the greenhouse still need to be maintained like any other electrical appliance. Careless manual watering of plants in greenhouses can also be dangerous if electric propagators or heaters are used. Swimming pools or jacuzzis that are fitted with electronic pumps or displays can cause a potential risk. Something as simple as leaving dripping wet washing on the line to dry could be harmful if the water was to drip on nearby electronics. All electrical equipment should be tested for safety, but any electronics that also involve water in any way should be maintained especially. If you are planning to use any water-related electronic equipment at your summer garden party, make sure to get them tested. Even well-installed electrical systems can get faults. Just because your swimming pool pump has worked 5 years in a row doesn’t mean a fault can’t develop this year. Electronics should be checked and maintained every year before they get used heavily in summer. Cables fray and plugs can become loose so checking them is the only way to ensure they are safe to use. If you plan to use electronic garden equipment this summer, always unplug them afterwards. If you don’t need to use a piece of equipment at your summer garden party, the best option is not to. Any equipment that connects to the mains shouldn’t be used with extensions leads. Any heavy duty electrical equipment, like mowers and BBQs, should be checked regularly. Electrical safety for your summer garden party can be achieved by paying attention to the condition of your garden equipment. Replacing old or damaged equipment is the first rule of electrical safety. Hiring an accredited electrical services company to perform maintenance checks on your garden electronics is the second. If there is any equipment that does not function correctly, an experienced electrician can identify the issue and fix it before harm can occur. At First Strike Electrical, we offer a variety of first-class electrical services across London. Our professional electricians are fully qualified and on hand 24/7 to give you peace of mind this summer. For more information on our services or to book an electrical inspection before your summer garden party, fill out our contact form or call us on 0203 633 4536.